This tour with Soualiga Destinations will be the highlight of your vacation! We are the #1 company on Tripadvisor for the last 8 years for excursions in all of St. Martin / Sint Maarten. Ready for your unforgettable trip? 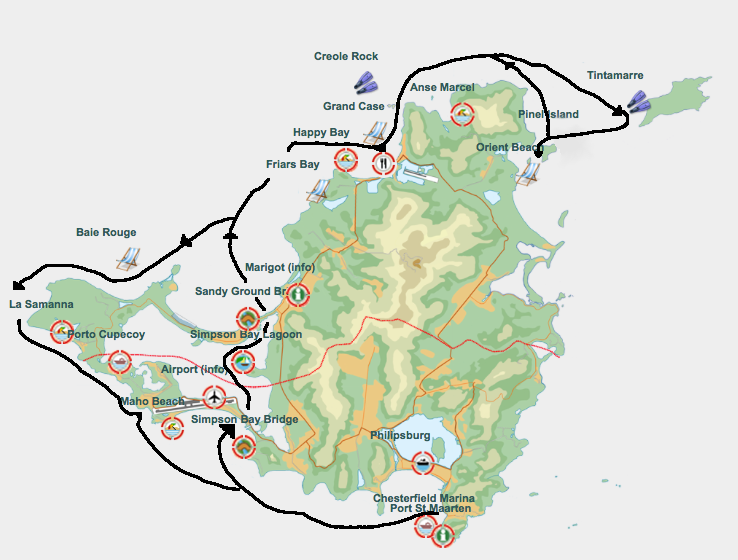 This tour is especially designed for island visitors and passengers of cruise ships. We get back to our dock no later than 4 PM. The boats leave from within walking distance from the cruise ship pier and do an all day excursion around St. Martin. It takes no more than 15 minutes to walk at a normal pace back to the cruise ship from our dock. Your “all on board” call is 4:30 PM for ships that depart at 5. In many years of working with thousands of cruise ship passengers, we have never let anyone miss the ship. If we did, we would certainly lose our #1 ranking. This tour is not sold through the cruise ship and avoids the usual cruise ship crowds. We depart from Dock Maarten, Philipsburg at 10 AM where we have several new boats ready to take you on the ride of a lifetime. Normal check in is at 9:30 AM and depart at 10 AM but we offer earlier and later departures depending on your ship’s schedule. Each boat has a capacity between 10 and 17 passengers and are never crowded with enough space to move around and powered with up to 3 X 300 HP motors. We always load 1 or 2 less than what we are certified by the coast guard to carry so there is always plenty of comfortable room for everyone. We return to the dock no later than 4 PM. Lunch is included for the price. Served onboard is Beer, Coke, Diet Coke, Sprite and bottled water included in the price. This is an excellent value and a very family friendly trip. 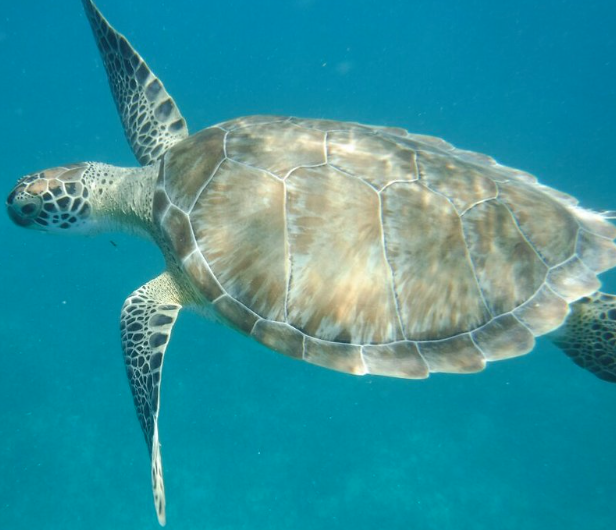 This excursion is fun for swimmers and non-swimmers alike. Please note: Anguilla and St Barts is not available to cruise ship passengers. We take off along the South coast of St. Martin traveling towards Simpson Bay. We pass through the Dutch side bridge into the Simpson Bay Lagoon. 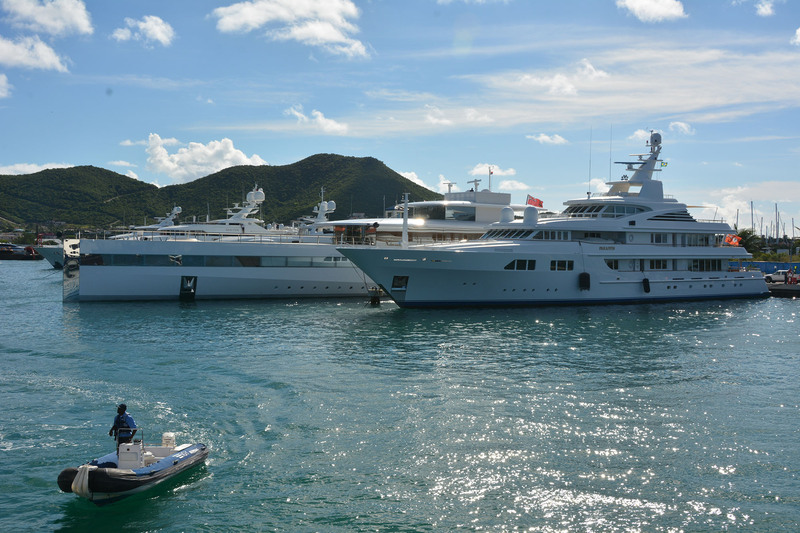 During the winter, we pass up close to some of the biggest private yachts in the world. Next we cross over to the French side of the lagoon heading towards Marigot and we go out under the French side bridge into the Caribbean Sea. 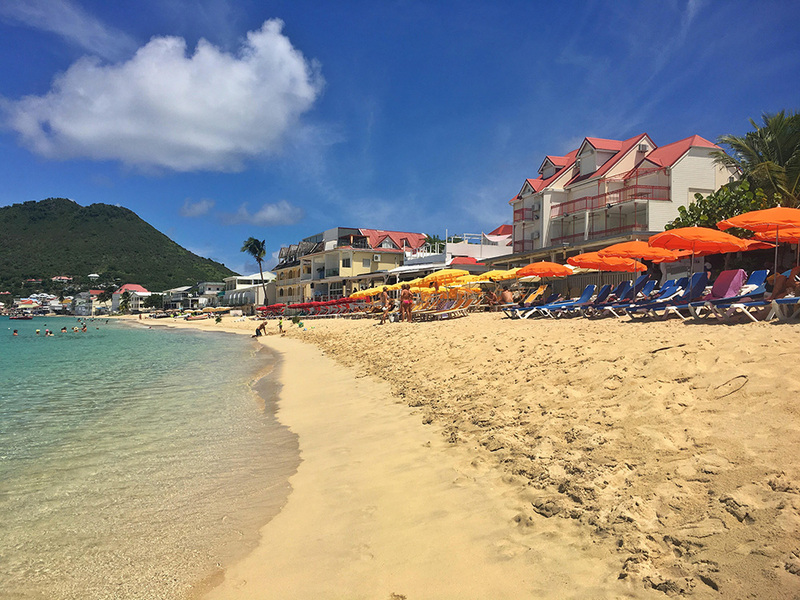 We travel along the North coast of St. Martin passing all the beaches along this coast, Lovers Beach, Friars Bay, Happy Bay and Grand Case. We also pass a most interesting rock formation. After, we continue along the coast past Anse Marcel toward the eastern side of the island and out into the Atlantic Ocean. After, we head over to Tintemarre Island if the group and the waves allow. It can be rough going there, but the spot is beautiful and a great place to swin. Tintemarre is a deserted tropical island in the French Natural Reserve with a beautiful beach and is usually un-crowded. There is no development on the island and no public transportation to it. 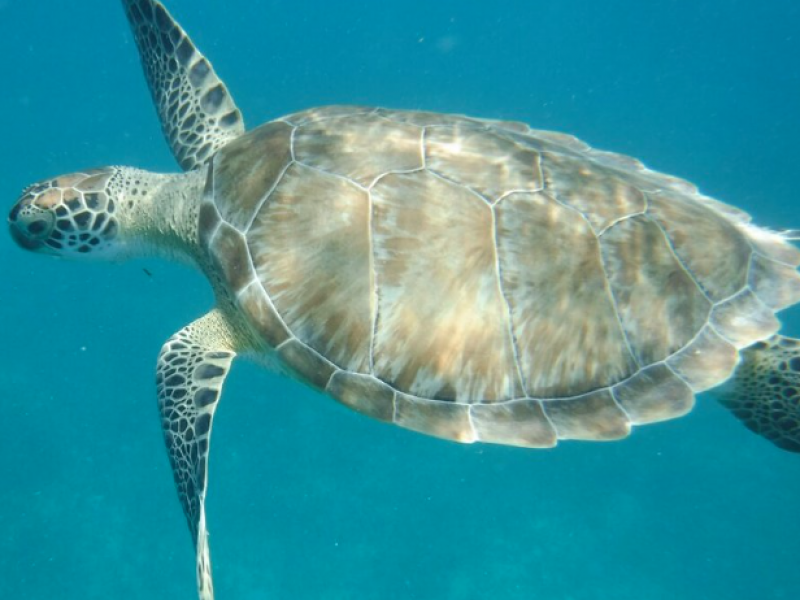 Turtles are almost always seen and if you are patient and quiet, they will surface right next to you and you will have an opportunity to get fantastic photos closeup while snorkeling. Next we continue on to Pinel Island where we have a short stop of 30 minutes. Pinel is a tropical paradise with calm, shallow, aquamarine water and swaying palm trees. There is a small boutique under the palms with inexpensive souvenirs that you don’t find at the regular tourist traps on St. Martin. We are serving a variety of delicious, fresh, french sandwiches with fruit and chips on the boat at Pinel Island. Options include a vegetarian choice. If you have any special requests we are happy to try to accommodate. 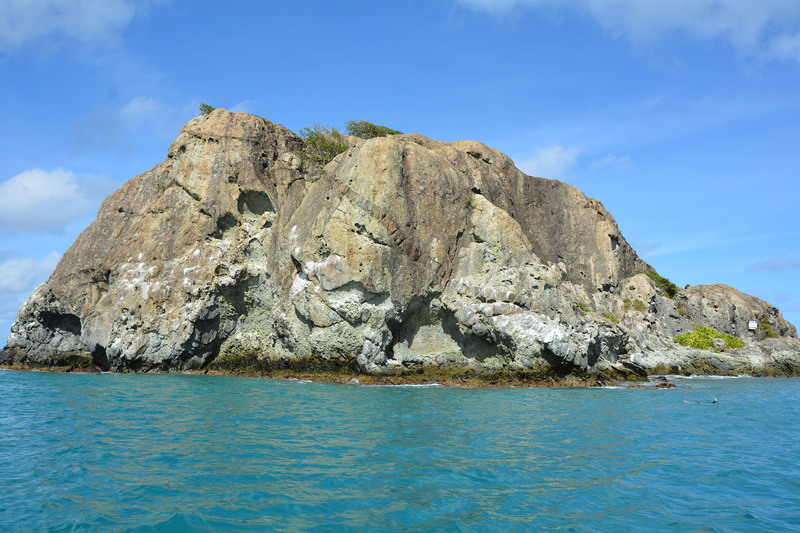 Depending on the weather and the number of boats present, we stop at Creole Rock or one of the other nice spots to do some more snorkeling. The ride is not always rough and is usually for just 15 to 20 minutes. Most of the ride is in protected areas where the seas are calm. 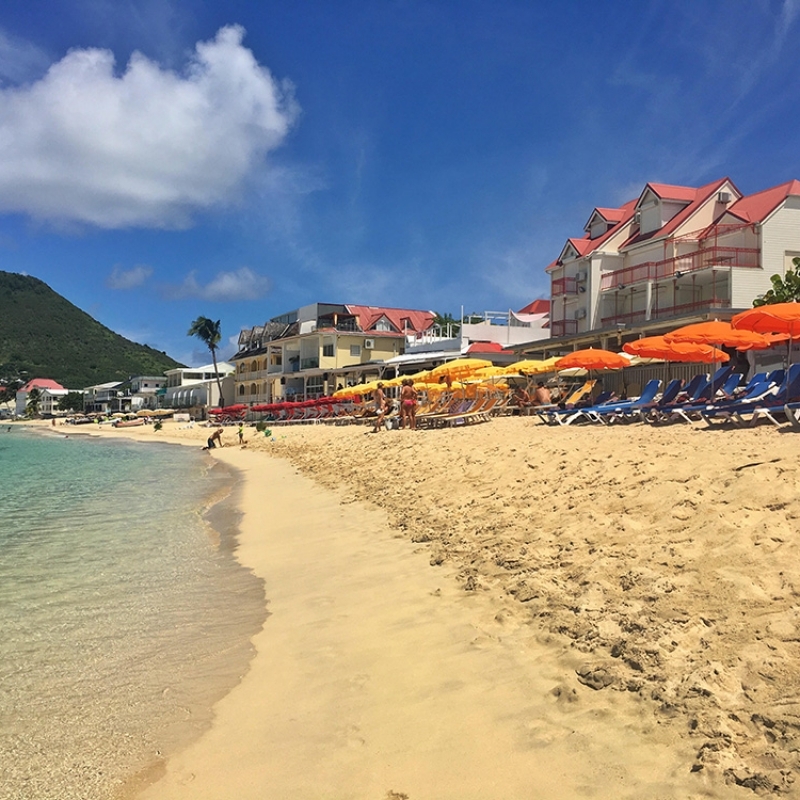 We then go back all the way around the island past the beautiful French Terre Basse beaches – Bay Rouge, Plum Bay, Long Bay. We stop for one last swim if time permits. We travel past Cupecoy, & Mullet Bay and then stop at Maho Bay to hopefully catch a big jet taking off or landing at the international airport. 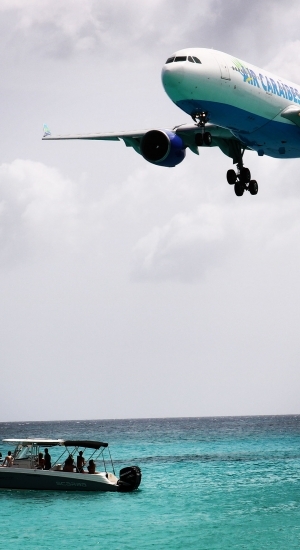 The planes pass very close over your heads and you get to see why PJIA international Airport is listed as one of the 10 most dangerous airports in the world. I think it was rated as #3 on the TV show of the same name. “You Tube” search “St. Martin landings” and you will see what I mean. Because the airport services a small island, there are not flights coming and going all day, every day. Normally we do get to see at least one big plane come in and go out but there is no guarantee. Some days there are no flights scheduled at the time we go by and on other days, if there is a delay or the plane leaves early we may miss them. 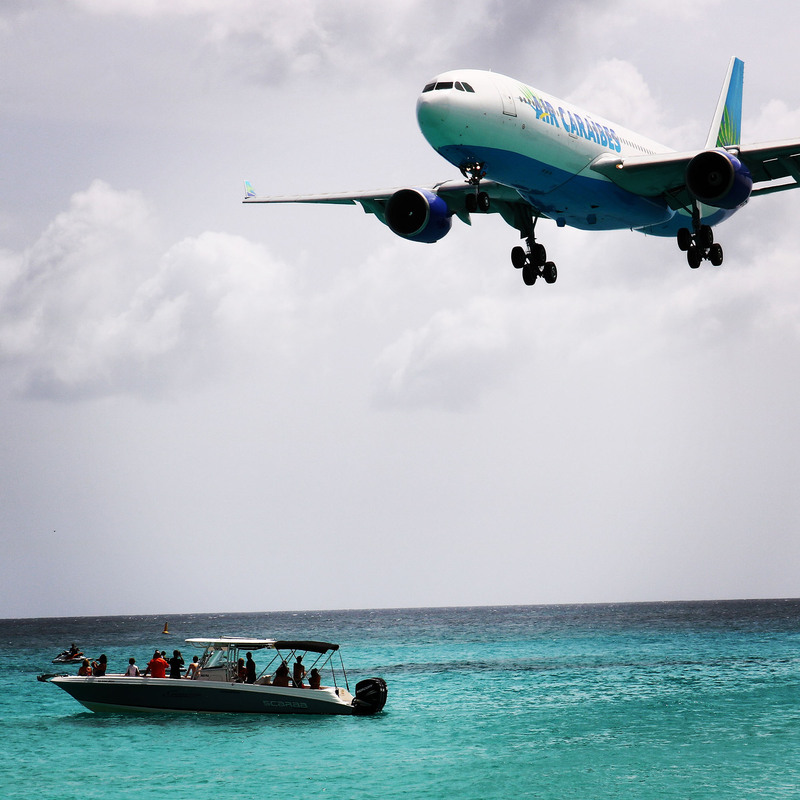 We do not get off the boat at Maho beach because we are forbidden to come close to the beach for safety reasons. The effect of being on the water right under them is still impressive plus the view of the “nuts” standing behind the jets as they take off is quite interesting. Then we continue back to Philipsburg for a 4 PM arrival which leaves you plenty of time to make it back to your ship for an “all a board “ at 4:30 and departure at 5.